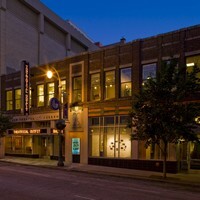 Balzer Theater at Herren's, home of Atlanta's third oldest professional theater company, Theatrical Outfit, was the former site of Herren's Restaurant. It was rennovated between 2002 and 2005 and turned into a perfomance space. The theater has stadium-style seating for 199 people with a 21' by 60' performance space. Parking: Parking is available in multiple lots and garages on Luckie Street. MARTA: Take MARTA to the Peachtree Center Station and leave by the Peachtree West/Ellis Street exit (follow the signs to the library). Upon exiting the station, cross Carnegie Street and walk two blocks down Forsyth Street. Turn right on Luckie Street. The Balzer Theater is on the left next to the Rialto Center.